The Boeing 737 is considered a short to medium range, single aisle, narrow body jet airliner. It was initially developed as a smaller, lower cost twin engine airliner modified from Boeing's 707 and 727, it has 9 variants. The aircraft was first planned in 1964 and it started operation in 1968. After 40 years, it became the most ordered and manufactured commercial passenger jet in the world. The first model was the 737-100. It was announced by Lufthansa in the year 1965and it started operation on 1968. It is the smallest model among any other models of 737. The 737-200 is just a 737-100 with a lengthened fuselage. It was announced by United Airlines in 1965 and started operation in 1968. Then came the 737-200 Advanced which is an improved version of the -200 announced by All Nippon Airways on May of 1971. 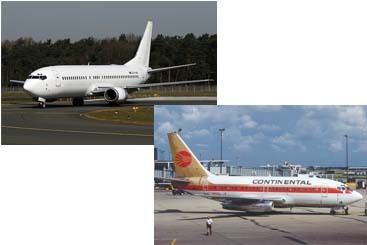 Other versions of this aircraft are 737-200C, 737-200QC, and Boeing 737-2x9 Surveiller.